A functioning smoke detector could save your life. 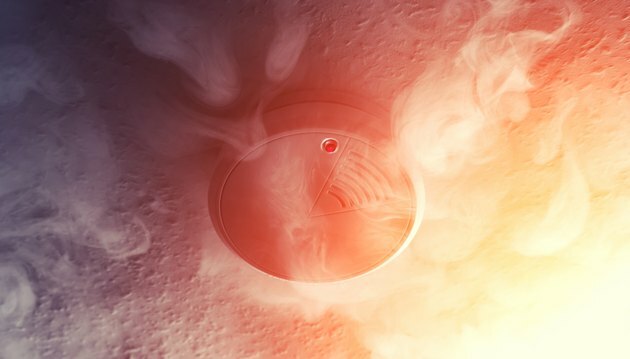 Smoke detectors have been around since the turn of the 20th century, but until the 1960s, they were too expensive for popular use. That changed when the first ionization smoke alarms powered by 9-volt batteries came on the market in 1972. They quickly became required safety equipment in residential construction, since statistics show that a house fire is 10 times more likely to cause injury or death in a home without working smoke alarms. The codes developed by the National Fire Protection Association (NFPA) to regulate smoke detectors have evolved as technology has changed and as costs to consumers have steadily dropped. There are now two main styles of smoke detector: battery-operated detectors that can be placed wherever needed; and so-called hardwired smoke alarms that are connected to the home's electrical wiring. While this type also has a backup battery, it is principally powered by the same wiring that powers a home's outlets and light fixtures. If your home's construction predates 1976, when the NFPA passed its first code regarding smoke alarms, having only battery-powered alarms may be legal, but during major remodel projects you will likely be required to change to a system of hardwired alarms. State law may require it but, more important, hardwired smoke alarms with backup batteries are safer than battery-powered ones. 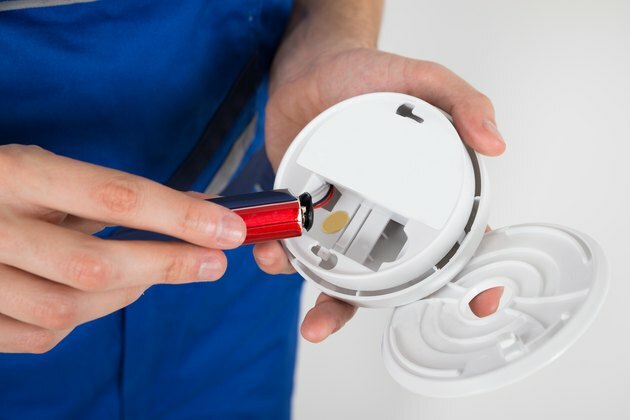 Current state regulations vary, but as far as the NFPA is concerned, new homes and recently remodeled ones should have hardwired and interconnected dual-function smoke alarms with sealed 10-year lithium-ion batteries. The term interconnected means that the alarms should be linked together so that if one senses smoke or fire, all alarms in the home will sound the alarm simultaneously. And the term dual-function means that they are designed to sense both the smoke of a smoldering fire or the heat of open-flame fires. Older smoke alarms have removable batteries, but newer ones are usually sealed. Some smoke detectors rely exclusively on batteries for power, but hardwired smoke detectors a have a battery that provides power only in the event of an electricity blackout, such as could happen during a lightning strike or other event that interrupts the electrical circuit. This makes a hardwired system much safer since it will fail only in the unlikely event that both circuit power and the battery fails at the same time. With a battery-only smoke alarm, on the other hand, a dead battery turns the alarm into little more than a piece of plastic. Fortunately, most battery-powered alarms are designed to send out a chirping alarm when the battery is growing low on power. Never ignore this admittedly annoying battery warning—change your batteries regularly. Hardwired smoke detectors must be on a dedicated circuit. 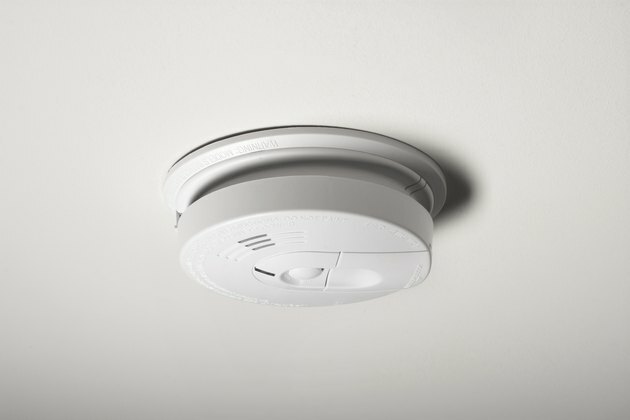 In a newer home or remodeled home with hardwired smoke detectors, each detector in a house must be connected to a circuit dedicated only to the smoke detectors. It's fine to wire all the detectors onto a single circuit, but that circuit can power no other outlets, lights, or appliances. 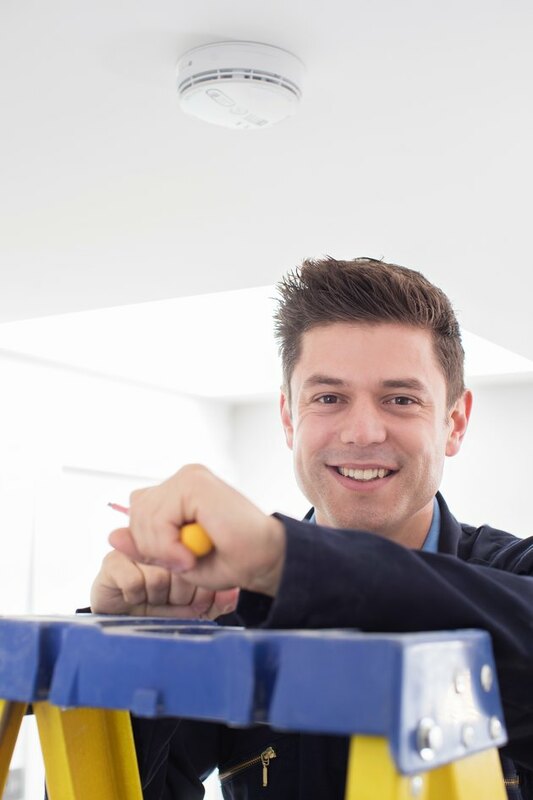 As is true for any electrical fixture, you must make the wire connections inside an approved electrical box, which is usually installed behind the drywall. While it is possible to wire the detectors so that each sounds independently of the others, most state fire marshals (and most fire codes) mandate that you create an interconnected network in which all alarms go off at the same time when one detects smoke or fire. To do this, the system must be wired from the main circuit panel with a 15-amp circuit and 3-conductor cable with a minimum wire gauge of 14. In this wiring scheme, the black wire is the hot wire, the white wire is neutral and the red wire is the traveler than links all the alarms together. The ground wire isn't used in alarm wiring, although it's still a good idea to connect the ground wire to the electrical box with a ground screw. Smoke and heat rise, so the best place for a smoke detector is on the ceiling. In places where you store flammable substances, such as the garage or basement. Smoke detectors should generally be placed on the ceiling or at the top of a wall, and never near a window, doorway, or air vent. If you put a smoke alarm in the kitchen, it's best to keep it at least 10 feet away from cooking appliances to avoid false alarms. 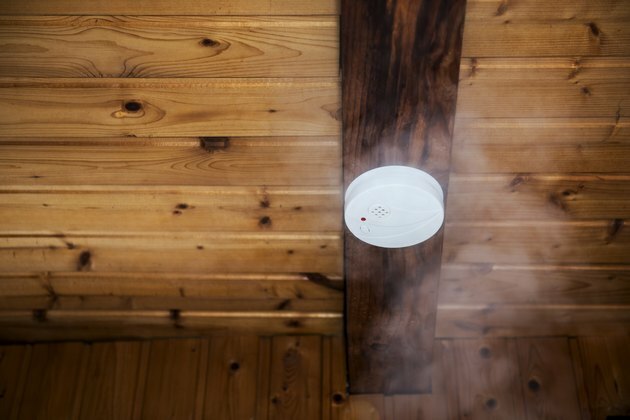 You don't need to put a smoke detector in an unfinished attic, and it's even a bad idea to do so, because the summer heat might make it go off. Smoke detectors aren't very ornamental but don't try to camouflage one by painting it. The paint can block the air grid and prevent smoke from entering the detection chamber. Photoelectric detectors are better at sensing smoke. Ionization smoke detectors, which were the first ones on the market, contain a small amount of radioactive material that ionizes the air inside the detection chamber. Photoelectric detectors, on the other hand, work much like the safety sensors on garage door openers. A continuous beam of light passes between plates in the detection chamber, and the alarm goes off when smoke (or steam) interrupts it. Ionization detectors do a better job at detecting flaming fires, while photoelectric detectors excel at detecting the smoke produced by smoldering fires. You get the best of both technologies by choosing a dual sensor smoke detector, and that's the recommendation of the NFPA. Some states now require carbon monoxide detectors as well as smoke detectors, and some manufacturers offer units that combine a photoelectric smoke detector and a carbon monoxide detector in one unit. But because these carbon monoxide/smoke detectors do not include ionization detectors, they do not offer maximum protection against fire. The best strategy to get maximum protection is to install stand-alone carbon monoxide protectors, as well as dual-function ionization/photoelectric smoke detectors. Smoke detectors aren't without problems. If your home is underserved or is an older construction, you can quickly provide adequate smoke/fire alarm protection by buying and installing battery-only dual-function smoke alarms in all the areas mandated by code. These smoke alarms may have their disadvantages, but your house is safer with them than without them. You will be better served, though, by having an electrician install a hardwired system of dual-function smoke alarms powered by a dedicated electrical circuit. This type of system is mandated in new construction and may also be required during major remodeling jobs. But you may want to install a hard-wired system even when not required, because it provides the maximum protection possible. 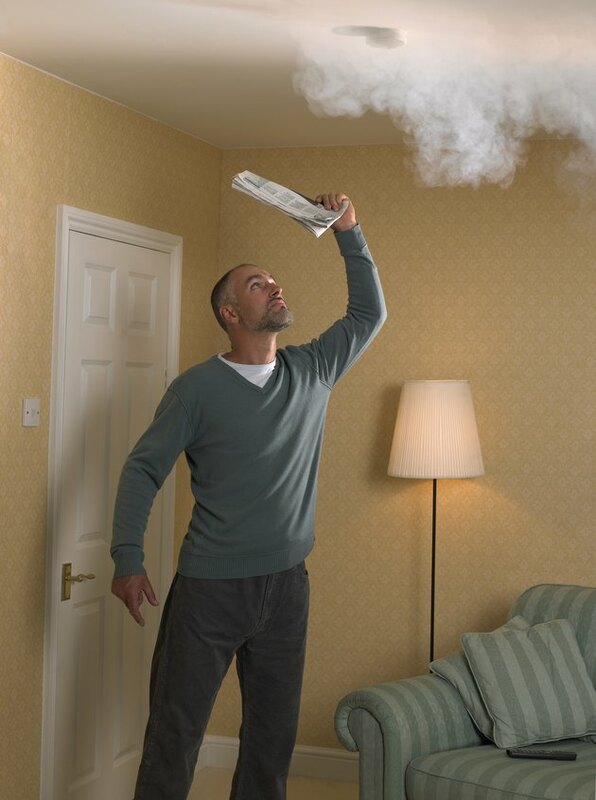 If you are installing battery-only detectors, it is best to avoid combination smoke alarm/ carbon monoxide detectors. Carbon monoxide detection is best handled by standalone detectors, which are also available in either battery-only, or hardwired systems. Do Hard Wire Smoke Detectors Have Batteries?